Property Size 734 sq. ft. This is a one bedroom cabin with a queen bed and bunk bed, bathroom with a claw foot bathtub, and a shower head for using while sitting in the tub, not standing, This cabin also includes a kitchen, TV with a DVD player, free wifi, a large deck over looking the large yard, and a briquette BBQ. This cabin sits on a large plot of land which is perfect for the dogs or kids to run around on! This cabin is in a quiet, peaceful location where you can sit out on your deck and read a book or relax in the sun. It is close to many of the Wallowa Lake activities including the Wallowa Lake Tram, a place to get ice cream, miniature golf, and more! It is also a short walk from Wallowa Lake. 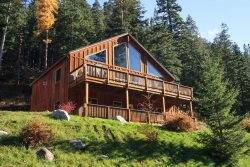 Come enjoy this little cabin that overlooks the mountains with your small family and take in the beauty of the Eagle Cap wilderness!